I have the great pleasure of teaching upholstery to the community of arlington and beyond. 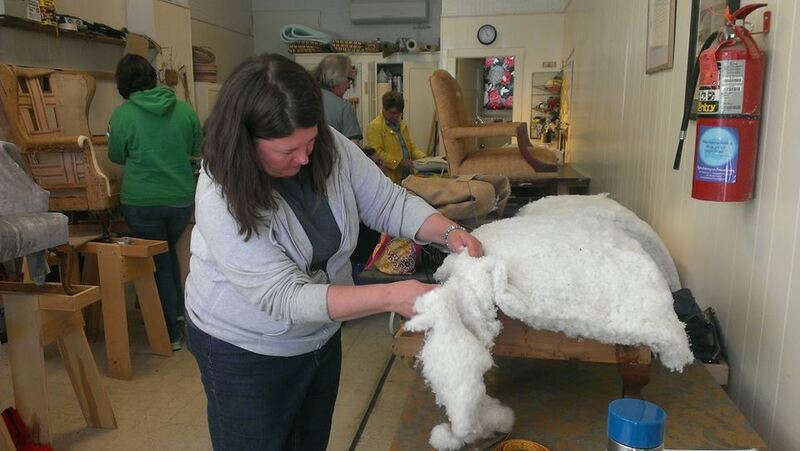 Take a peek below, at the basic class information regarding future classes as well as our past students hard at work, enjoying the art of upholstery! Weekday classes usually run 8 consecutive weeks, one day a week. Projects are "one seat " upholstery projects (no love seats or sofas) scissors, pliers, mallet chisel and a home tool box if you have one. The first class will be estimating for fabric and project expectations.Please consider taking your project home at the end of each class , storage is difficult due to space limits.Our classes are usually limited to 6 people. For students who have completed three or more classes, check out our "Master" class on Saturdays. This class is designed for past students who want to advance their skill working along side Kevin. We use more of the modern tools and applications. This class is usually limited to 6 people as well. Cost 425.00.